The Secret to Great Gravy? Is there anything better at turning a good holiday meal into a truly great one than a lake of delicious gravy? We have all been caught us all off guard by lumpy, pasty tasting gravy at least once. Usually after we have already covered our turkey and mashed potatoes with it. Thick, rich, and flavourful gravy doesn’t come easy, but properly mixing dry powders with liquids is a simple concept that just takes a little finesse to perfect. If you think about making gravy in terms of “good mixing” you can’t go wrong. First, you only need about 1/4-1/3 cup of holiday bird or roast drippings, being careful to leave all the little brown bits that contain a ton of flavour. Dry flour particles are difficult to mix evenly and getting it right is the trickiest part of making gravy. One approach is to combine flour with water or stock in a jar and shake it vigorously, thoroughly wetting out the particles to make a uniform slurry. Add the flour slurry to the drippings while bringing the mixture to a boil, continuously agitating to thicken. As the liquid evaporates from your gravy mixture, the ingredients combine and thicken making the flavor more concentrated. Constant mixing while your gravy boils down will ensure it remains uniform without separation while it gets passed around the table. As your gravy bubbles, keep watch on how viscous it is. You want to the final product to be thin enough to pour easily, but thick enough to cover its target thoroughly. No one likes lumpy gravy! Agitate constantly with a wire whisk while your gravy thickens to avoid lumps. If your gravy is lumpy no matter what you do, strain it through a large colander or strainer. Using a blender or food processor to try to remove small lumps from gravy is nearly impossible. Salt is the key to the best gravy but you need to add slowly and taste constantly. Start with about 1/2 tsp. for 4 cups of liquid. Then sprinkle in a tiny bit at a time, mixing and tasting. 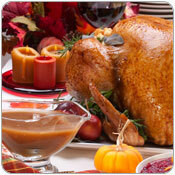 You’ll know when you have the right amount, because the gravy will suddenly come alive with a marvelous meaty flavor. There you have it. A few solid mixing principles that hold the key to making delicious gravy that everyone will fight over. The only problem with gravy is that it is the final kitchen task before the meal, since you need the drippings from the roasting pan for the best flavor. For best results, try to get others to help with finishing other dishes while you focus on that gravy! The products we purchased from Dynamix met our expectations in both performance and quality. Very good service from Dynamix, and the overall experience was excellent.